KISSES AND RIO's owner died unexpectedly and they need a home! 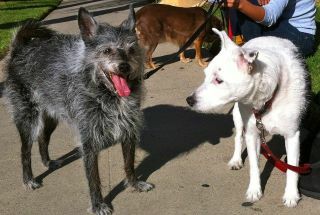 The two semi-senior dogs "RIO" (the Cairn Terrier/Schipperke mix) and "KISSES" (the deaf, but high-functioning Parsons Jack Russell Terrier)are in need of a home together or separate. Cheryl has ONLY UNTIL JANUARY 24TH TO RE-HOME THEM!!! Their foster mom tells me that they can be split up, so I am looking for an experienced JRT person to take the JRT and the Cairn/Schipperke can go somewhere else. UNFORTUNATELY, I HAVE NO TIME TO WORK ON OTHER DOGS UNTIL I GET THESE TWO IN THEIR NEW HOMES! They are both exceptionally sweet & affectionate, spayed, housetrained and get along with other dogs and cats. They come with food, bedding, leashes, collars, bowls, etc.They are in California. Comments for KISSES AND RIO's owner died unexpectedly and they need a home! We've taken Kisses into our home this weekend. She is a great Jack Russell and has a mate (another JR). Glad we could give her a good home. I wanted to put a comment on this so that it gets bumped up to the top of the page in case people don't scroll to the very bottom. I feel for these two pups and really hope they find a home. Seeing a story like this makes me wish I could take in 1,2,3 even 4 dogs. But, the 3 I have is just enough for me to handle....plus my husband would't be on board! I really really hope there is someone that can take these guys in! !